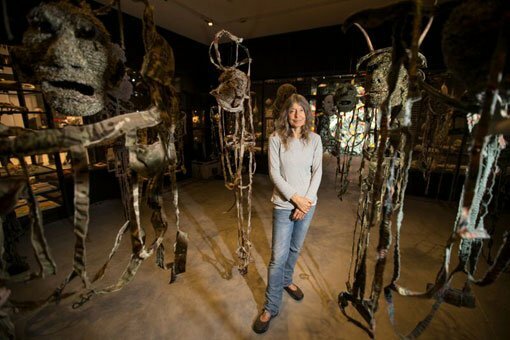 For those of you encountering the new acquisition Fool’s gold at the Art Gallery of NSW and wondering why the name rings bells, the artist Fiona Hall has been popping up all over news services in recent weeks as Australia’s representative at the 56th International Art Exhibition, Venice Biennale 2015. Her Venice exhibition, Wrong Way Time , sees Hall bring together hundreds of disparate elements that exhibition curator Linda Michael says come from ‘three intersecting concerns: global politics, finances and the environment’. It is Hall’s passion for the natural environment – and her despair at our critical role in its demise – that is most keenly felt in her new Venice installation. But this passion has been lifelong, and reveals itself explicitly in works like Fool’s gold . Fool’s gold was inspired by her 2011 expedition with scientists and conservationists to the contested Kermadec Trench. The Kermadec Trench is a 1200-kilometre channel of overlapping tectonic plates northeast of New Zealand, stretching toward Tonga. It is a migratory path for important species of marine life and is regarded as one of the most geologically dynamic yet vulnerable environments on earth; it is also seen as a lucrative asset for mining industries and commercial fishing. 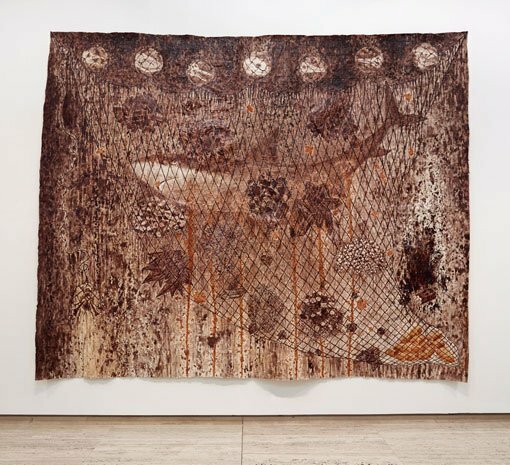 In Fool’s gold , Hall has painted barkcloth (tapa) made from the mulberry tree with natural dyes and ochres – the traditional methods and natural materials of Tonga. There’s a reef shark snared in a net anchored by gold bars. The net is buoyed by floats that carry portraits of the skulls of endangered species. Incised into the shark’s skin are the symbols for gold (Au), lead (Pb), silver (Ag), barium (Ba), copper (Cu) and zinc (Zn). Also entangled are sticks of dynamite, coral, and a skull and cross bones. Based in Adelaide, Hall is an Officer of the Order of Australia. Her representation at Venice – the first in the new Australian Pavilion – is a fitting honour for an artist long considered one of the country’s most important, environmentally sensitive and inventive. Wrong Way Time can be seen in Venice until 22 November 2015; Fool’s gold in the contemporary galleries right now.